Adam Carolla is one of the most versatile men in Hollywood. After cutbacks forced Adam to quit his syndicated self titled “Adam Carolla Show” broadcast on CBS radio, Adam started “The Adam Carolla Podcast” with only a computer and a microphone from his home office in Feb. 2009. A year later, the podcast was named iTunes #1 Podcast Of 2009, receives more than five million downloads a month, and has been featured in Fast Company Magazine, Entrepreneur, the NY times, and the LA times. Adam’s book, In Fifty Years We’ll All Be Chicks, is a comedic gospel of modern America, and has been garnering rave reviews from critics and fans alike. 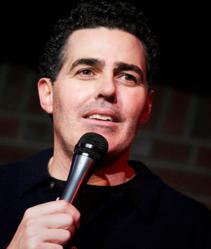 Don’t miss Adam Carolla at the Uptown Theatre Napa on Saturday, June 2nd, 2012. Doors open at 6:00pm, show starts at 7:00pm. Following brief stints as a skilled carpenter and boxing trainer, he began his career in radio after answering an ad seeking a boxing instructor to train then radio personality Jimmy Kimmel of KROQ's KEVIN AND BEAN SHOW in Los Angeles. He eventually joined the show's repertoire as Mr. Birchum, a woodshop teacher. Carolla's success on KROQ led to a hosting job on the nationally syndicated radio program "Loveline," with Dr. Drew Pinsky. MTV developed a television version of the show, which was co-hosted by Carolla and Pinsky for five seasons (1996-2000). The duo also authored The Dr. Drew and Adam Book: A Survival Guide to Life and Love. With their partner Daniel Kellison, Carolla and Kimmel are the heads of Jackhole Industries and have created and starred in two hit Comedy Central shows, "The Man Show" (1999-2003) and "Crank Yankers" (2002-present). Jackhole Industries also executive produced "Gerhard Reinke's Wanderlust," a comedy travel show which aired on Comedy Central, and a reality-based feature film, Windy City Heat, which won The Comedia Award for Best Film at the 2004 Montreal Just For Laughs comedy festival. Tickets for Adam Carolla are $40. They are on sale now and can be purchased through the theatre website at http://www.uptowntheatrenapa.com, at Ticketmaster (http://www.ticketmaster.com) or at the theatre box office (please call 707.259.0123 ext. 6 for hours). To find out more, please visit http://www.uptowntheatrenapa.com.